In January, more than 29,000 people from 60 different countries gathered in Denver, Colorado for the first joint Outdoor Retailer and Snowsports Industry of America trade show (OR + SIA). 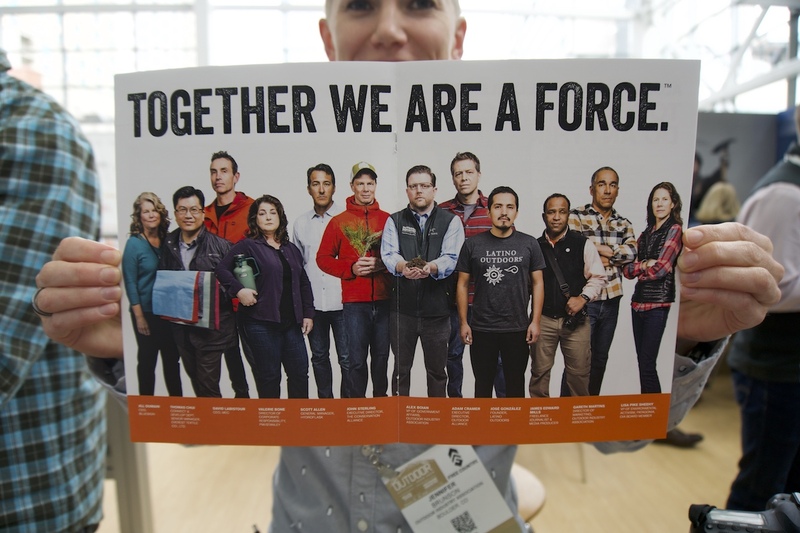 The slogan of the Outdoor Industry Alliance (OIA), "Together we are a force," appeared everywhere, from roof banners to stickers. It was a sign of the trade show's emerging political intent: to draw the industry together to address broader issues, including public lands, diversity and inclusion, environmental sustainability and climate change. Throughout the busy week, calls for collaboration dominated speeches, educational events and casual conversations. As the OR Summer Market dawns this week, echoes of similar messaging reverberate throughout the pre-show buzz. With global temperatures on the rise, a warming climate not only directly threatens winter snow and ice sports, but also the general vitality and longevity of human existence on the planet. In January, Jake Crouch, a climate scientist at the National Oceanic and Atmospheric Administration's National Centers for Environmental Information told the public, "In 2017, every state in the Lower 48 had an average temperature that was above average, and this is the third consecutive year that has been the case." In February 2018, the Federal Bureau of Economic Analysis estimated the size of the annual outdoor recreation economy at $373.7 billion. This figure puts the outdoor industry ahead of mining, oil and gas extraction industries in the annual US GDP. Lori Weigel, a partner with Public Opinion Strategies, put it in simple terms, "The power of the industry is evident." "Congress definitely heard from this industry [last year]," said Alex Boian, the vice president of OIA's government affairs, at the winter show. In May 2017, the Access Fund and the American Alpine Club organized climbers, outdoor advocates and industry professionals to visit 50 different congressional members and officials. During the joint "Climb the Hill" campaign, 40 speakers voiced their opposition to President Trump's plan to shrink national monuments and expand fossil fuel development on public lands. "We're going to build on that [oppositional] momentum for the 2018 elections," Boian added. Following last year's success, climbers, advocates and outdoor industry representatives rallied again in May for another "Climb the Hill" campaign, fortifying their unified political voice. After spending three days in the capital, Brown Girls Climb Founder Bethany Lebewitz told Alpinist that she was heartened to see more of a degree of inclusivity during 2018's "Climb the Hill," though she felt there was still plenty of room left for all groups to be represented in the outdoor industry and environmental advocacy. Joe Whittle echoes Lebewitz's comments in an article for Alpinist 62. "A conversation about the land is a conversation about Indigenous people," he wrote. The notion of outdoor spaces being "playgrounds," he explained, "is not that different than the false concept that their sole purpose is for resource extraction." The very recreational attitudes of the outdoor industry need to be thoroughly addressed for its members to engage effectively with the environmental threats that continue to rise today. The summer show promises to expand further upon this conversation about inclusivity and relationship-building with Indigenous communities via at least half a dozen panels and lectures. Some of which include: "Elevate Conservation: Outdoors for All," a free event open to the public that will bring together "diverse stakeholders, political leaders, and outdoor industry representatives to elevate conservation advocacy, diversity, equitable access and inclusion in outdoor recreation, and protecting our public lands;" an afternoon "Workplace Equity Working Group" that will gather "peers, key stakeholders, and competitors to work in collaboration to create an index of agreed upon diversity, equity, and inclusion (DEI) practices in the industry," which will mirror the same way OIA's sustainability working group created the Higg Index; "Breaking a Paradigm: Why Focusing on Women Is Not Enough" a facilitated conversation that will explore "where white women and women of color overlap and diverge in experiences" and focus on how to steer the next generation of industry professionals towards broader social perspectives and business frameworks; and also a "#SafeOutside 'Boulderside Chat'" with Department of Justice veteran and University of Colorado researcher, Dr. Callie Rennison, and data scientist and business operations strategist Charlie Lieu, "for a round table discussion on risks and mitigation of sexual harassment and assault, including best practices for preventing, addressing and handling occurrences." A significant part of the industry's impact on the environment takes place in the manufacturing supply chain, which includes packaging, materials resourcing and transportation, explained Nikki Hodgson, OIA's Corporate Responsibility Manager. "Nearly 20 percent of industrial water pollution comes from textile dyeing and treatment," she said. "We have a responsibility and an opportunity to address that." To convey the extent to which companies contribute to pollution, in 2012 the OIA and the Sustainable Apparel Coalition went public with a web-based sustainability tool—the aforementioned Higg Index. The metrics used allow brands to evaluate all points in their product supply chain for environmental and social impacts. As of January, Hodgson reports that at least 126 OIA member accounts have adopted the Higg Index. At the winter show, Ali Kenny, Burton's senior director of global supply chain and sustainability, announced the Higg Index revealed that Burton, with their non-recyclable base layer of packing, had been producing an estimated "10,000 pounds of [waste] materials" per year. According to Kenny, the company has since switched to using recyclable materials in their packaging. "It was about a decade ago that we did our first greenhouse gas baseline emissions calculations," Jenn Vervier of New Belgium Brewing told winter show attendees, "and also a decade ago that we made the decision, when we had the realization, that we could become net-zero everything." Still, as easily as a brand may now input data into the Higg Index to analyze their supply chain, the auditing systems set in place for their offshore factories are still difficult to validate. Furthermore, the social impacts on the workers themselves remain to be addressed. In a 2015 article in The Atlantic, the author stated, "A study from NYU's Stern Center for Business and Human Rights last year found that the sheer size of the [US] clothing industry and its dependence on off-the-books workers make it difficult to reduce health violations and dangerous practices at factories overseas." 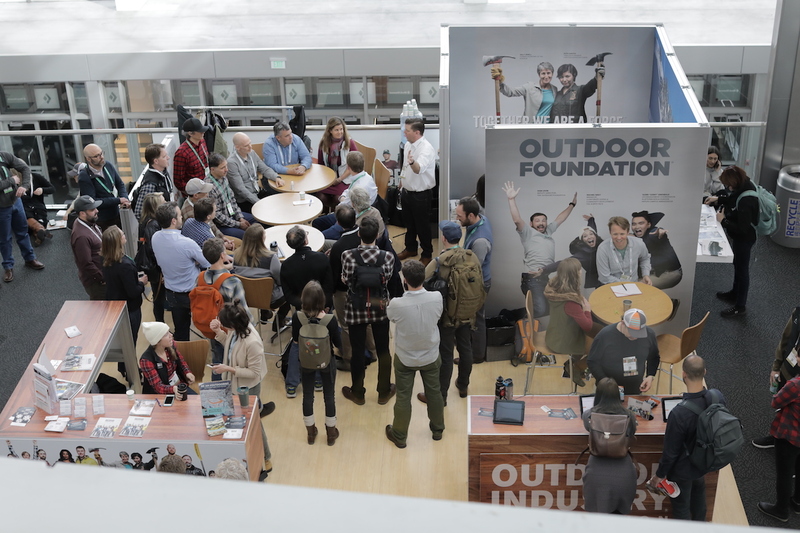 The conditions of factories and workers owned by outdoor industry brands have rarely been openly spoken about or discussed in outdoor media. "Most companies exhibiting at OR make things outside the US. But increasingly, the progressive ethos that informs the tastes of consumers and company development is running counter to the realities of offshore manufacturing," stated a 2017 article written for CompanyWeek.com. In the Footprint Chronicles, Patagonia describes ongoing attempts to improve working conditions in the factories that make their gear. Kenny predicts that companies and their supply chain practices will be held widely accountable in the near future. "I personally think [sustainability scores] should be the nutritional label for customers to judge brands in the end," she said. That way, she explained, customers and retailers can both "make an informed choice." As yet, most businesses only employ the Higg Index for internal self-assessment. Sets of comparative data from various apparel manufacturers have not been published, and is therefore currently unavailable to the public. However, on the morning of Sunday, July 22, OIA presented the first look at the 2017 outdoor industry Higg Index Facility Environmental Module data, in addition to more information on their expectations for an industry-wide adoption of the Higg Index in 2019. In a January OR Show panel on climate change entitled, "Filling the Void: Taking on Global Warming when our Country Isn't," Amy Roberts, the executive director of OIA, emphasized the need for bipartisan cooperation. Protect Our Winters (POW) executive director Mario Molina agreed that it's time to stop considering climate change as a political boxing arena, that the issue is not as "divisive" as some people think. Indeed, a January 2018 survey (Conservation in the West Poll) found that more Western voters consider themselves to be conservationists today—regardless of their political affiliation—than two years ago (from 63 percent in 2016 to 76 percent in 2018). 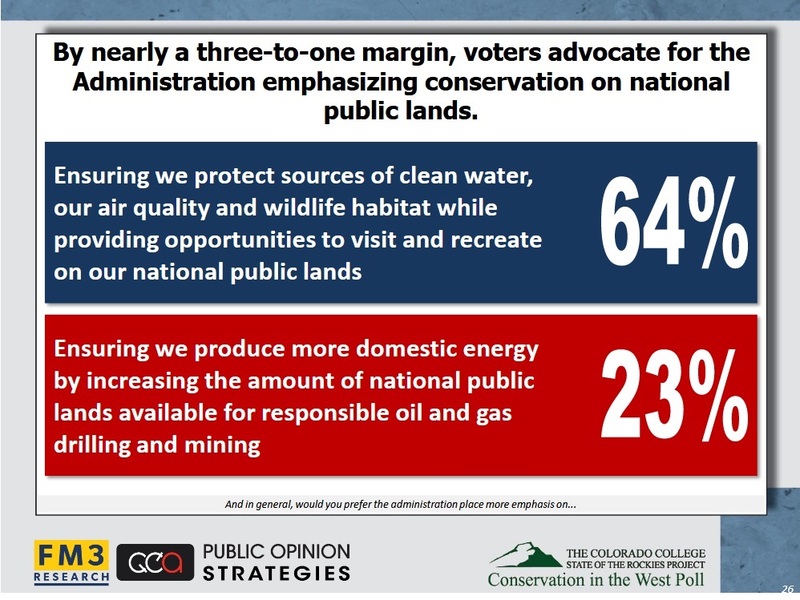 In every Western state, according to the survey, the majority of its voters indicated that they supported public land protection over resource extraction. This suggests bi-partisan land conservation policies, which can help mitigate climate change by preserving natural landscapes and fending off future fossil fuels development, may loom on the horizon. However, zooming out to look at the whole country and how partisan demographics view the importance of addressing climate change, a March 2018 Gallup poll paints a slightly different picture. 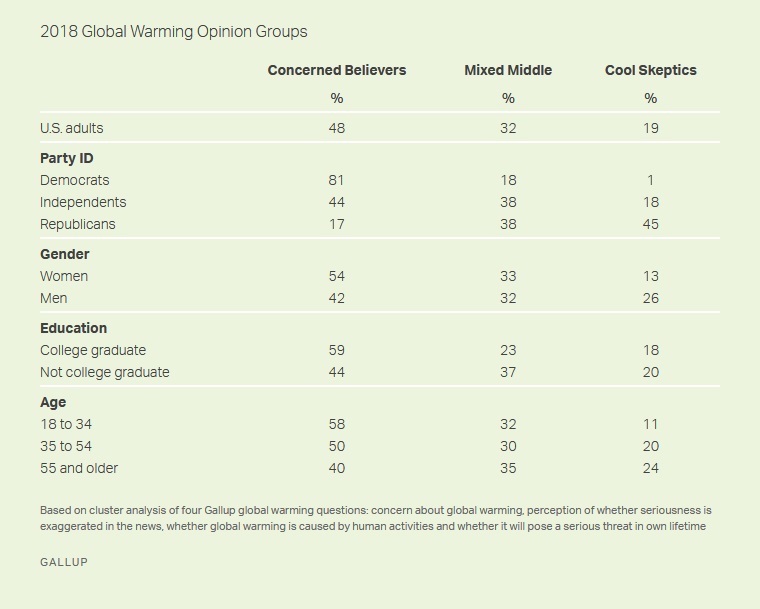 The survey found, "In general, Democrats view global warming seriously, while Republicans view it skeptically." Further, according to their data, "Almost nine in 10 Democrats say increases in the Earth's temperature over the last century are due to human activities more than natural changes in the environment. Just 35 percent of Republicans agree, while 63 percent attribute the temperature increases to natural environmental causes." Compared to last year, when 40 percent of Republicans believed global warming was human-caused and 87 percent of Democrats agreed, the divide beyond the western states does seem to be growing. Partisan relationships aside, however, the Gallup results maintain as a bottom line, "The higher level of concern Americans [as a whole] have exhibited about global warming since 2016, particularly in terms of worrying about the issue and believing it is caused by human activity, is largely intact this year." Yale University also published a nationwide, nonpartisan, study in March 2018, where they found, "Certainty has increased 12 percentage points in the past three years, with 49 percent of the public now 'extremely' or 'very sure' that global warming is happening." With this in mind, as the outdoor industry looks ahead, there is an opportunity for growing and widespread support as the industry catalyzes climate solution-oriented policy and best practices. A Union of Concerned Scientists article from January 2018 reports that recent studies found that 97 percent of climate scientists and 97 percent of scientific articles agree "that global warming is real and largely caused by humans." Within weeks of the federal administration's withdrawal from the Paris Climate Agreement, a slew of outdoor companies pledged, "We're Still In." As Amy Roberts of the OIA explained in January, "We're Still In" represents a "commitment by the private sector and by state and local leaders to carry out and achieve the targets that were set for carbon reduction" by the Paris Accord. As of yet, neither Outdoor Retailer nor its parent company Emerald Expositions are among the signatories. On the other hand, the city of Denver is. In addition, the OIA has made their policy clear regarding climate change advocacy and best practices, including giving industry "preference to vendors, service providers and production facilities, both foreign and domestic, that incorporate industry best practices (such as alternative energy sources and other carbon reduction strategies) into their operations." During the January trade show, recycling bins populated the convention center hallways, though compost bins were few and far between. At the industry breakfast, all attendees were given a reusable to-go coffee mug. But most of the cutlery and food packaging distributed throughout the week were single-use and non-recyclable or unlabeled. Individual attendees were therefore left to determine what was in fact recyclable versus what was landfill waste. In a sustainability report published by the Colorado Convention Center in the first week of March, the weeklong January OR+SIA produced 9.3 pounds of waste per attendee. Only 25.8 percent of that was recycled and 8 percent composted, whereas the remaining 66.2 percent of waste went to a landfill. 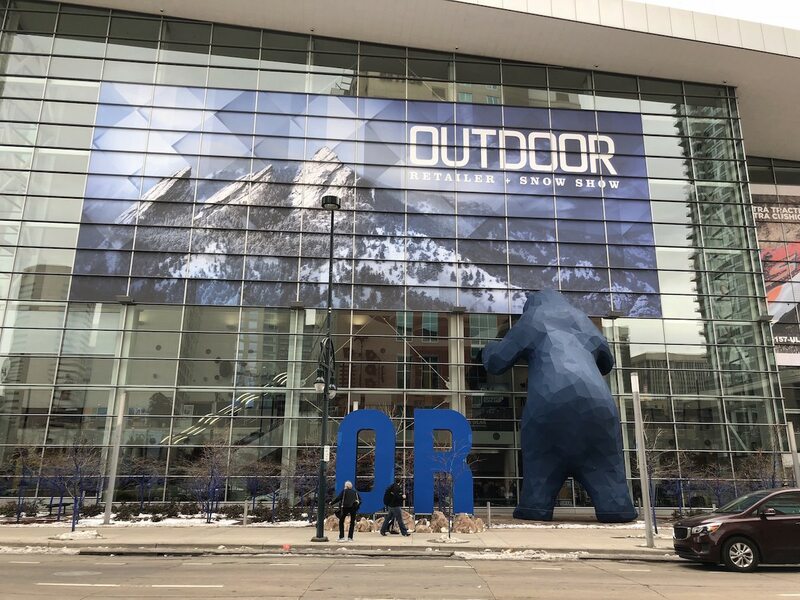 Because this was the first event for Outdoor Retailer at the Convention Center, this data set will inevitably set the waste, water, and energy bars for future trade shows. Can OR + SIA reduce these numbers in years to come? The industry at large has the resources to provide tools, education and messaging to enact and inspire best practices, said OIA's policy advisor Andrew Pappas. At last year's industry breakfast, POW's Molina had rallied the crowd, eliciting cheers and applause. "So what are we going to do? Are we going to stand on the sidelines?" In the months that have followed since January, in addition to demonstrations such as the Climb The Hill campaign, there have been continued announcements from industry brands adopting ambitious sustainability plans and pledges, a handful of sustainability meetings were planned on behalf of the OIA Sustainability Working Group for Day Zero of the summer show, and an announcement that the official industry-wide Higgs Index adoption will be celebrated over one of the trade show's breakfasts. "Now, more than ever, it's vital that the outdoor industry comes together as a force and takes advantage of our impressive and unique power to create healthy economies and healthy communities," said Roberts in a press statement last month. "I hope all Outdoor Retailer Summer Market attendees will come to our free Outdoor University education sessions." With the range of educational seminars and classes arranged throughout the trade show—including Florence William's industry breakfast speech on the importance of accessible nature, numerous panels about topics such as "Why the future of the outdoor industry depends on water" and the aforementioned educational events about inclusivity and diversity in environmentalism—it will most likely be impossible to leave the trade show without confronting the dilemma of climate change's reality and the role a manufacturing global industry plays in global warming. 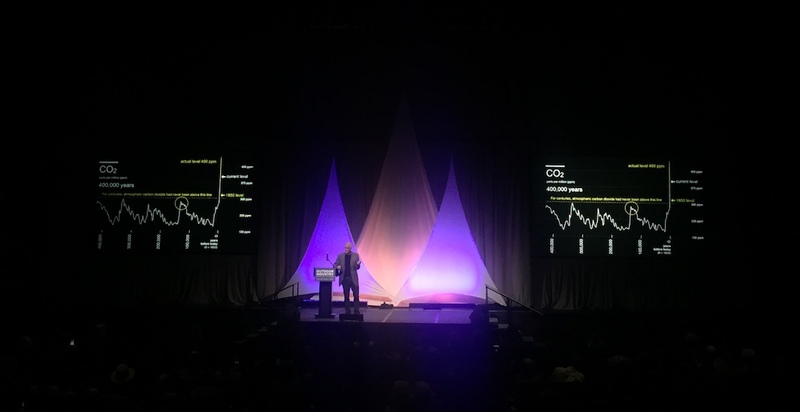 Whether effective steps toward a reckoning of these dilemmas are achieved or merely talked about throughout the summer trade show, it's important to remember what Paul Hawken, environmentalist and co-author of Drawdown: The Most Comprehensive Plan Ever Proposed to Reverse Global Warming, told the industry in his keynote speech at the winter show: "Taking responsibility is not a burden—it's a gift."